RFX Market Speed is an indicator designed to measure a new dimension of the market which has been hidden from the most traders. 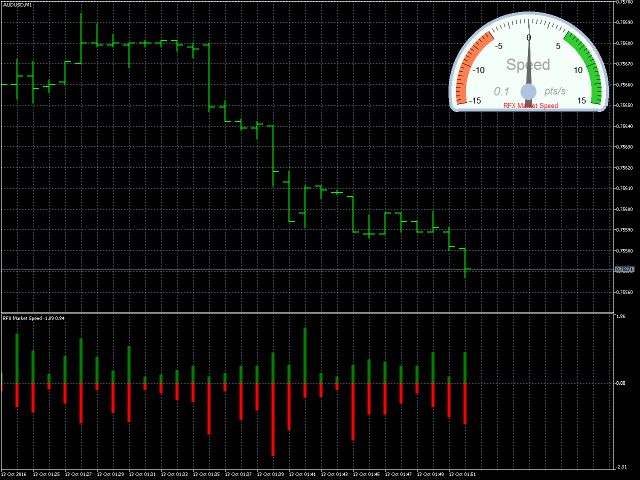 The indicator measures the speed of the market in terms of points per seconds and shows the measurement graphically on the chart, and saves the maximum bullish and bearish speeds per each bar. This indicator is specially designed to help the scalpers of any market with their decisions about the short bias of the market. The indicator uses real-ticks and cannot be fully tested in the strategy tester. Select Price Type: Three different price types can be selected: Bid, Ask and (Bid+Ask)/2. Maximum Range (pts/s): The value identifies the extreme speed to show on the gauge. Play Sound? : If it is set to Yes, an alert sound will be played. Send Notification? : If it is set to Yes, a notification will be sent. Send Email? : If it is set to Yes, an email will be sent.